If you are already able to do the Green Curry Paste this will be a piece of cake. The only difference is the color of the chilies. Thai cooking can be so simple :-)! If not, don’t worry. It is as easy as it looks. And if you can’t handle spicy food just use less paste for the dish you are preparing. Put all ingredients, including (sea) salt in a mortar. Massaman Curry is a relatively mild, but rich Thai curry which is actually a Thai interpretation of a Persian dish. You can find is as well on many menus written as Matsaman, Mussulman or even Muslim Curry since it is believed that the name refers to the Muslims. Where the dish really originates from is disputed. Some think it is coming from Central Thailand, namely the court of Ayutthaya. Others believe that it is a Southern Thai dish, influenced by Malay and Indian cuisine. The most common variety of Massaman Curry is Massaman Curry Chicken with other varieties being beef, duck, mutton and goat. Porc is not very often used, since it is “haram”, meaning forbidden, for muslims. The Massaman Curry paste is quite different to the other common curry pastes in the Thai cuisine. This is due to the use of rather non typical spices in the paste like Cardamom, cloves, cinnamon, cumin, star anise, bay leaves, nutmeg and mace. These ingredients came from the Malay Archipelago and South Asia, a trade route dominated at the time by Muslim traders from the middle east. These ingredients were then combined with local produce spices which are used in the other Thai curry pastes like dried chili peppers, lemongrass, coriander seeds, shrimp paste, galangal, white pepper, shallots and garlic. If you are a curry fan check out our other curry recipes like Phanaeng Curry, Green Curry and Yellow Curry. If you did the cooking class with Joy you should be able to prepare them after the recipe shown. Add salt and some water until everything is covered. Steamed fish with lime sauce is really easy to cook, looks impressive and tastes like heaven. There are only a few ingredients necessary and these are easy to get in the western world. Pla (ปลา) is the Thai word for fish. Pla Kapong (ปลากระพง) is usually translated into English as Snapper. The only problem is, that the fish sold on the markets and offered in restaurants as white snapper is in reality a Barramundi or Asian Sea Bass. This fish is very popular all over Asia and northern Australia and is now becoming much wider distributed. However, this Thai dish tastes very good as well prepared with a red snapper, grouper or similar fish. Nueng (นึ่ง) means “steamed” and Manao (มะนาว) means “lime”. You will find this dish in every single good sea food restaurant in Thailand. It is worth remembering the Thai letters or at least the Thai pronunciation of the dish: The best and most authentic restaurants in Thailand do not have the menus in English or English speaking waiters. Now have fun with cooking! Put the fish prepared how you learned in the cooking class in the pan / wok. Chop garlic and ginger together so they are mixed and put in a bowl. Sprinkle celery on fish, close the lid and let it boil for another 10 min. In this cooking lesson we are preparing one of the Thai versions of a worldwide popular starter and snack: Popiah, which is the name for spring rolls in Singapore, Malaysia, Taiwan and Thailand. 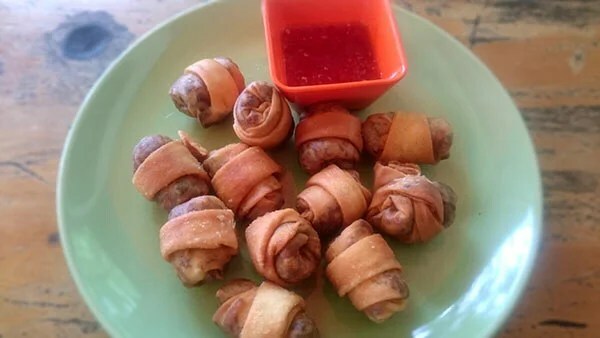 Spring rolls are rolled and filled appetizers which come in a large variety. Its origins are from China. The Chinese chūn juǎn (春卷) literally translated means “spring roll” and comes from a pancake filled with fresh spring vegetables. The popiah we are preparing in this cooking class is the fried one, the most common variety in Thailand. If our cooking students are interested, we teach as well the tiny snack variety shown in the picture. Other varieties of Popiah are “Salad Rolls”. This is often the choice or our more health oriented vegetarian students. The difference to the spring rolls described here is merely that it’s rolled in a different pastry and not deep fried. This way to prepare spring rolls is more common in Vietnam, which is the reason that the pastry used is called “Vietnamese spring roll pastry”. It actually is just rice paper. For now have fun with the popiah cooking class. The recipe for this cooking class is the most common variety of Tom Kha, which is Tom Kha Gai, or Chicken Galangal Soup. In case you already had a look at our Tom Yum cooking class recipe you know that Tom (ต้ม) means “cooked” in Thai language. Kha (ข่า) means Galangal, as well known as Thai Ginger of Galgant. But this is not what most foreigners remember when they have eaten this famous Thai dish. It is the creamy coconut milk which is the base for this soup. The coconut milk softens the heat of the spices and gives you a nice afterburn in the throat. Add coconut milk to a sufficient sized pot. Add the galangal, chopped lemon grass, chopped onion, baby corn, carrots, garlic and some water. Add sugar, salt, chicken, mushrooms, tomatoes and the rest of the coconut milk. Hardly found in any restaurant outside of Thailand, this cooking class is about a Thai snack, which is very popular with westerners, visiting the island destinations in the South of the country. The dish literally has no name in Thailand. It is a snack originating out of times of poverty, when people scrambled to make a living. This dish was made out of scraps. The name is probably not older than a few decades. It probably was named when American soldiers on leave from the Vietnam War were asking for the name of the dish. The Thai script in the title sounds “No Name Pak” with “Pak” meaning “vegetable”. In our recipe for the cooking class is already mentioned in the ingredients “… and more vegetables of your choice” which can be taken face value – just experiment with any scraps you have at hand. They work as well with minced meats like pork and chicken and as a more sophisticated variety with prawns. Have your ingredients ready. The 2 little bowls on the plate are the Red Curry Paste and the finely chopped lime leaves. Behind the plate you see the tempura and rice flour. Add all the vegetables, egg, red curry paste, salt and sugar into a bowl. If you are vegan, just leave the egg away. Add more flour if it is too wet and start spooning it into the hot oil. Just take spoon full and scoop the mixture off the spoon with another spoon or fork. In this cooking class we will prepare the most common variety of Tom Yum: Tom Yum Goong (Shrimp). This soup dish originates from Laos and central Thailand. It is a popular choice in neighboring countries such as Cambodia, Vietnam and Singapore. By now it is well known all over the world. The name literally translated from Thai language means “to boil” (Tom) and Yam is the name of a spicy and sour salad. The dish for this cooking class has indeed hot and sour flavors. Fragrant herbs and spices are generously used in the broth. Due to it’s combination and balance of herbs and spices appealing to an entire array of different tastes ranging from spicy over sour and bitter to salty, it could be considered to be “The Thai signature dish”. Fun fact: Tom Yum Goong is the title of one of the best known Thai action movies although it was marketed in the US as “The Protector”, in the UK as “The Warrior King” and in Germany as “Revenge of the Warrior”. have fun with your Tom Yum cooking class! Bring prawn heads with water to boil in a pot and simmer for 30 min. Pour through a strainer. If you are using already peeled prawns just skip this step. Add lemon grass, galangal, garlic, baby corn, carrots, tomatoes and Onions to stock/ water and boil for a while. Already add as well salt and sugar to taste. Turn off the gas when the prawns are cooked and add the celery and spring onions. If you like the taste, add some coriander as well. Now squeeze some lime juice in to taste. The Phanaeng (or Panang, Penang) Curry is originating from central Thailand and the recipe goes back hundreds of years. The word Phanaeng comes from the Khmer language meaning cross, mostly used for a cross-legged seating position. Traditionally the chicken was placed in a cross legged position upright on the grill. The chicken was bathed in the curry paste with grounded peanuts and then brushed with the same mixture over the whole cooking process. Later the process was simplified by cutting up the chicken in large pieces and, instead of being prepared on the grill, it went to the pot where it was cooked in the sauce. In this cooking lesson you will learn how to cook the Phanaeng Curry Chicken or, if you are vegetarian, Phanaeng Curry can be prepared as well as a vegetarian dish with Tofu. At home you can use the now widely available ready made pastes. However, more tasty is of course to make your Phanaeng Curry Paste from scratch. Ingredients for one portion. As you can see there is quite a bit more curry paste than a tea spoon. One tea spoon is for a European palate with very little tolerance for spicy food. Just start with a tea spoon and add more if you like it more spicy. You can always add more paste until the very end of the recipe. Just keep in mind that you can't reverse the process :-). As for the vegetables the amounts can vary as well according to taste. Add baby corn and carrots and a bit of water. Add oyster sauce, sugar and salt. Bring to boil again. Add chicken and stir it in. An easy desert recipe which we often add to our cooking courses as a freebee if we feel the chosen dishes to prepare in the cooking class are too easy and fast to cook. Banana with Coconut - " กล้วยบวชชี "
Add bananas, and salt and sugar to taste. Let it boil until the bananas are almost done. Add the rest of the coconut milk, bring to boil and serve.